Since 1988 Hip Hop fans have been hearing from Mac Dre, the Mac, DJ Cec, Coolio Da 'Unda' Dogg and Stevie D. Since 1992 we started hearing from Mac Mall, Dubee, P.S.D., Reek Daddy and Sleep Dank. After that along came J-Diggs, Vital, Tic, E.B., Crest Creepaz and Thizz Kids. 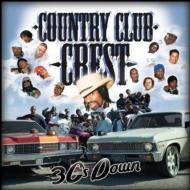 All these great people make one super group, Country Club Crest, on these all new tracks!